wear a Mustang to match your Tussy lipstick! says this 1966 ad for Tussy lipstick and a sweepstakes to win one of 5 Mustangs, in one of 3 different shades of pink. The text of the ad reads: Tussy's exciting new lipstick line features three racy new shades. Racy Pink, a pale pink, racy pink frosted, shimmers with pearl, defroster, pours on melting light to lips or lipsticks. In a brand new cage of sleek white plastic smartly trimmed with gold, on a swivel base... 1.00. And 5 lucky winners will receive a zippy '67 Ford Mustang custom-colored to the new Tussy lipstick shade of their choice. Be sure to pick up your contest entry blank at the cosmetic counter. This ad was placed by Rhodes Western Department Stores in the September 11th, 1966 edition of the Oakland Tribune of Oakland, California. Rhodes was a large, multifloor, department store in Oakland. It is now a Museum. 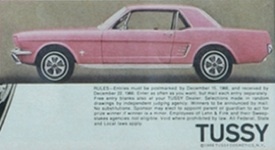 Advertisement for the Tussy Mustang Sweepstakes. Three winners receive a 1967 Mustang in the Tussy Pink shade of their choice. The colors may have been the three new revved-up shades of Tussy lipstick: Racy Pink, Shimmery Racy Pink Frosted, and Defroster. This ad is from the September 1966 edition of the Seventeen magazine. The date of this ad may explain the use of a 1966 Mustang in the photos.